Topinambur! What can it do? Treatment with topinambur contributes to the detoxification of the body on cellular level and the gradual normalization of the metabolic processes. Topinambur has remarkable curative properties. It contains about 16% inulin, and its dry matter exceeds 70 %. Inulin is a polysaccharide, which when hydrolyzed, is degraded to fructose – a sugar substitute that can be safely used by diabetes patients. Topinambur contains a little cellulose and a wide range of microelements. Its tubers actively accumulate silicon from the soil in amounts of about 0.8% of dry matter. The iron, silicon and zinc contents of topinambur outmatch those of potatoes, carrots and beetroot. 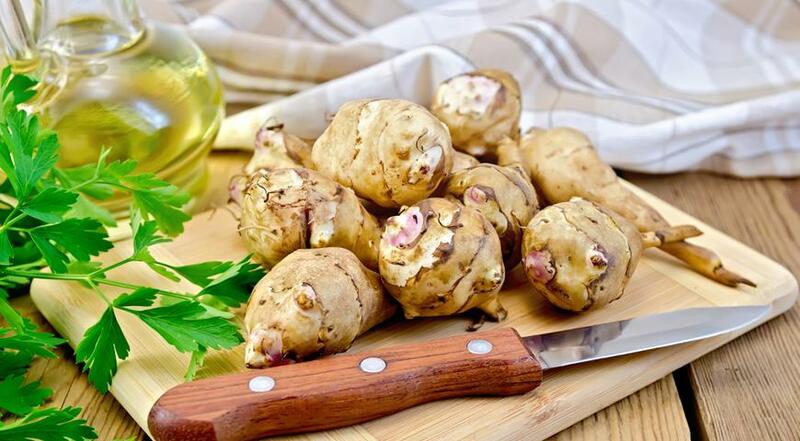 Topinambur tubers also contain proteins, pectin, amino acids, organic and fatty acids. In addition, topinambur contains three times larger amounts of vitamins ?1, ?2, ? than carrots, potatoes and beetroot. Mineral elements are also present in the tubers: iron, manganese, calcium, magnesium, potassium, phosphorus, sodium. An important difference that sets this unique plant apart from other plants is its protein content, represented by 8 amino acids, including essential amino acids which are only synthesized by plants and cannot be synthesized in the human body, namely: arginine, valine, histidine, isoleucine, leucine, lysine, methionine, threonine, tryptophan, and phenylalanine. Topinambur tubers contain malic and fumaric acids, as well as small amounts of citric and succinic (amber) acids. The high concentration of biologically active substances making up the chemical composition of topinambur determines the benefits of the plant to dietary nutrition, diabetes diets and diets for patients suffering from many other diseases. The healing effect of topinambur is connected with its ability to lower the levels of blood sugar, cholesterol, triglycerides and lipoproteins, and to normalize the carbohydrate and fat metabolism in the body. It is recommended in periods of physical and psychoemotional stress, low work capacity and chronic fatigue syndrome. In prophylaxis and treatment of acute and chronic infectious diseases, topinambur enhances body resistance and immunity. Topinambur improves metabolism and exerts favourable influence in patients with obesity, disorders of the gastrointestinal tract, and disbacteriosis. Inulin, contained in topinambur, is a complex carbohydrate made up of 96 % of fructose. Inulim stimulates the growth and activity of bifido and lactic acid bacteria. The assimilation of this carbohydrate does not require insulin, therefore its use is especially suitable for patients with Type 1 and Type 2 diabetes. The presence of natural biological fibers and pectin allows using topinambur for body detoxification, efficient prophylaxis in cases of intoxication with organic solvents, drugs, or alcohol. This is what determines its hepatoprotective properties. Topinambur appeals to people advocating healthy eating, athletes and fitness enthusiasts. Topinambur can become an important element in the diets of people suffering from obesity, and acts effectively against constipation. An important effect is observed in patients with osteoporosis – inulin considerably increases calcium absorption in the intestines and normalizes the lipid metabolism. The world practice confirms the effective use of topinambur in cases of disbacteriosis, because the high inulin content prevents the growth of pathogenic microflora and promotes gastrointestinal tract recovery. The consumption of topinambur in home-made and commercially-made foods contributes to intestine cleansing and natural prophylaxis of many diseases, primarily of cancer and diabetes. Topinambur is efficient not only in the treatment of iron deficiency anemia, but also in the treatment of thrombophlebitis – a condition where incorrect metabolism of blood substances can cause formation of blood clots which obstruct the normal blood circulation and can block the blood vessels.